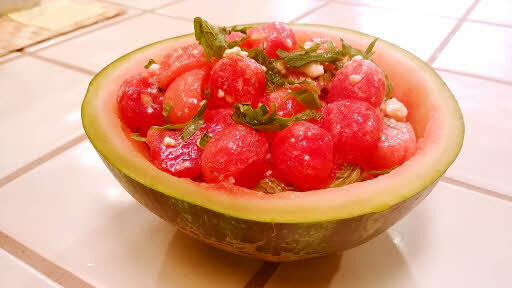 Watermelon salad is perfect for hot summer days, when you want something sweet, juicy and refreshing. A hint of Tabasco gives it a little spiciness while lemon juice makes it a little tangy. Feta cheese gives it a creamy texture and mint leaves add to the freshness and aroma. Cut the watermelon in half and scoop out the roundels using a melon baller. Scoop out the trimmings also as we will use the shell for serving the salad. Use all the trimmings for a watermelon drink. If you don’t have a watermelon baller, scoop out the whole watermelon using a knife and then chop them in cubes. Cut a thin slice off the bottom of the hollow watermelon shell so that it balances well. Whisk together olive oil, lemon juice, Tabasco, salt and pepper. Wash and chop mint and basil leaves roughly. Crumble feta cheese with fingers. Mix everything gently in a bowl and serve it in the hollow watermelon shell. Watermelon Salad is ready. Watermelon is about 90% water, so it’s really good for summers. In fact, it grows in hot climates only. It’s amazing that nature gives us the food, according to the climate. It is effective in reducing both your body temperature and blood pressure. Watermelon is a nutrient dense food. It provides high levels of vitamins, minerals and antioxidants and just a small number of calories. Watermelon is great for the skin because it contains vitamin A. Too much vitamin C, abundant in watermelon, can cause symptoms such as diarrhea or gastrointestinal discomfort.